I took time off the trail for Easter. My side of the family always comes to visit the farm and we often end up with close to 20 people at our house for holiday. We actually have enough bed space between the house and the barn to accommodate everyone. Easter was great. I was so appreciative of having a refrigerator and a well stocked kitchen. It seemed easier than previous years. I suspect some of the adversity I have faced is helping me look at life differently. I am becoming more relaxed, more grateful and more present. Easter is over and I need to resume logging miles. I am heading back to pick up where I left off. My new goal is making it to Hampton, Tennessee then further north to Damascus, Virginia. By late morning, I see my first fellow hiker whose trail name is Weathergirl. She begins walking with me and her story soon emerges. Weathergirl has battled a slew of health issues. The trail is her personal determination to not let illness define her life. Ominous looking clouds fill the sky by the end of the afternoon. There is supposed to be the Vango/Abby Memorial Hostel somewhere close by. It’s run by a previous thru-hiker named Scottie. We look for the wooden sign that lists the mileage remaining to get to Springer, GA. This is the only indicator for where to get off the trail to find the hostel. For a brief moment, I feel like a little kid on a grand adventure. Another hiker, whose trail name is Wombat, is sitting on a bench attentively placed at a vista point right before the secret signage. We share the information about the hostel hidden in the woods and he says he will join us. Wombat is in his 50s and seems to be questioning why he is hiking the trail and how he got himself into this. He is nursing some injuries and seems homesick to me. I am growing accustomed to seeing internal mental struggles in a hiker’s eyes. A combination of hardships and lots of time alone seems to be the cause. Doubt descends like a dark storm cloud and hikers start to second guess the goals they’ve previously set. This is a crossroad where every hiker must chose between pushing on or throwing in the towel. Weathergirl and I head down a path and within several minutes see a charming clearing. We go to the main house and meet Scottie who gives us the key to the second story room that we’ll share for the night. After cleaning up, the rain begins and I watch it from our balcony. It’s lovely. I take off early in the morning ahead of Weathergirl and Wombat. I am very protective of my time and I make sure to hike alone for parts of each day. I like talking to other hikers and hearing their stories but I must avoid the trap of putting on my counselor hat. Focusing on other’s needs has a way of distracting you from taking care of your own needs. The words, healer, heal thyself, repeatedly enter my mind. In Hampton, I meet a trio including grandparents and a granddaughter. The grandfather is 70- the oldest thru-hiker I have met. The granddaughter is 14- the youngest thru-hiker I have met. We end up doing some sections together for the next couple of days. I seek to find a balance between times of solitude and times of connecting. The granddaughter, a 20 year old section hiker from California named Robin and I all slack pack together. Watagua Lake is flooded from the recent rains. We can see the Appalachian Trail but it is underwater and we must detour at a higher elevation. Poison ivy is everywhere and by the end of the day, I have a nasty itchy rash surrounding my ankle. I will later find out this is actually heat rash and an allergic reaction I am having to the wool in my socks. None of this matters though because what is important is that I have completed my first 20 mile day. 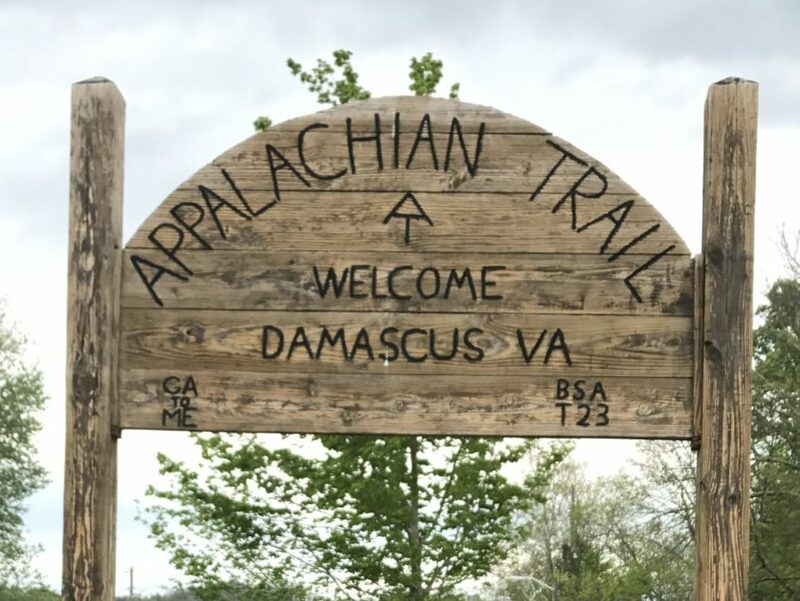 Another day of hiking and Damascus arrives. I say goodbye to the trio and look around the famous trail town. It’s quaint and lively this time of year with many thru-hikers taking a zero day and resupplying. I will be heading home to see Mike and take a brief break. I have decided I will flip flop back to near Max Patch and begin hiking southbound through the Smokey Mountains.